A state-of-the-art marine facility delivering data and new insight to the ocean science community, policy-makers and the public worldwide has received additional support from the National Science Foundation (NSF). The NSF awarded a coalition of academic and oceanographic research organizations a five-year, $220 million contract to operate and maintain the Ocean Observatories Initiative (OOI). The coalition, led by the Woods Hole Oceanographic Institution (WHOI), with direction from the NSF and guidance from the OOI Facilities Board, will include the University of Washington (UW), Oregon State University (OSU), and Rutgers, The State University of New Jersey. The OOI is an advanced system of integrated, scientific platforms and sensors that measure physical, chemical, geological, and biological properties and processes from the seafloor to the sea surface in key coastal and open-ocean sites of the Atlantic and Pacific. The facility was designed to address critical questions about the Earth-ocean system, including climate change, ecosystem variability, ocean acidification, plate-scale seismicity and submarine volcanoes, and carbon cycling with the goal of better understanding the ocean and our planet. All OOI data are freely available online. 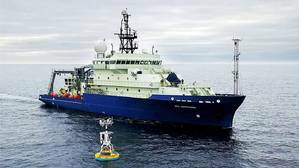 Each institution will continue to operate and maintain the portion of OOI assets for which it is currently responsible: WHOI will operate the Pioneer Array off the Northeast U.S. coast and the Global Arrays in the Irminger Sea off the southern tip of Greenland and at Station Papa in the Gulf of Alaska; UW will operate the Regional Cabled Array that extends across the Juan de Fuca tectonic plate and overlying ocean; OSU will operate the Endurance Array off the coast of Washington and Oregon; and Rutgers will operate the cyberinfrastructure system that ingests and delivers data for the initiative. In addition, WHOI will serve as the home of a new OOI Project Management Office. "We at NSF are proud of our continuing investment in 24/7 streaming data from the ocean and coupled earth systems," said William Easterling, NSF Assistant Director for Geosciences. "From underwater volcanoes to ocean currents, OOI enables cutting-edge scientific discoveries and makes big data accessible to classrooms at all levels. These data are key to addressing everyday challenges, such as better storm predictions and management of our coastal resources." The OOI officially launched in 2009, when NSF and the Consortium for Ocean Leadership (COL) signed a cooperative agreement to support the construction and initial operation of OOI's cabled, coastal and global arrays. The launch represented the culmination of work begun decades earlier, when ocean scientists in the 1980s envisioned a collection of outposts in the ocean that would gather data around the clock, in real- and near-real time for years on-end and enhance the scientific community's ability to observe complex oceanographic processes that occur and evolve over time scales ranging from seconds to decades and spatial scales ranging from inches to miles. "OOI is transforming ocean science and we are pleased to take on this new leadership role to ensure that the initiative continues to serve both the science community and the public," said WHOI President and Director Mark Abbott. "We look forward to continuing to work with NSF and our partners toward the success of the initiative as part of a growing global network of ocean observing systems." The Project Management Office, which is a new addition to WHOI's role in the overall operation of the OOI, will report directly to NSF and will provide high-level oversight and financial management of the project. In addition, the office will coordinate with partner institutions to establish annual priorities for each of the arrays individually and for the network as a whole. "The Project Management Office represents a new set of challenges for us," said WHOI Senior Scientist John Trowbridge, lead principal investigator on the OOI. "But it also presents incredible opportunity for us and for our partners to advance our ability to observe, study, and understand the ocean." WHOI will also continue to operate two Global Scale Arrays and the Coastal Pioneer Array. The Pioneer Array spans a persistent ocean front on the continental shelf and slope south of New England, a dynamic region where complex physical processes control the exchange of nutrients and other properties between the coast and the deep ocean that strongly influence coastal ecosystems. One of the Global sites is in the Irminger Sea south of Greenland, a key location in the global ocean circulation system known as the "great conveyer belt." The other Global site, at "Station Papa" in the Northeast Pacific, has been the focus of continuous scientific observation since 1949 and is an important location for intensive, multidisciplinary studies to improve understanding of critical ocean processes such as ocean acidification. "WHOI is very excited to continue operation of the Global and Pioneer Arrays," said WHOI physical oceanographer and OOI Project Scientist Al Plueddemann. "These and the other sites are motivating new science on their own and also contributing to increased collaboration among ocean scientists funded by NSF and other agencies."